It was only just a few years ago that I had my first beet that wasn’t from a jar and pickled beyond recognition. Now roasted beets are one of my favorite salad toppings. In this particular recipe, it is the salad. This dish is incredibly easy to prepare, looks impressive, and goes well with just about any meal. 2. Wash the beets and wrap them in tinfoil, place on a baking pan and cook until tender. 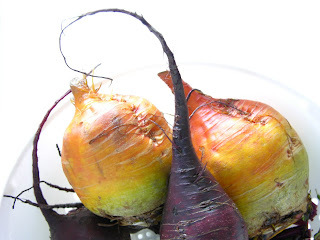 Larger beets (about ½ pound sized) will need about 1 ½ hours, smaller beets need 45 minutes to an hour. For best texture, try not to overcook them. 3. Unwrap them and let them cool for 30 minutes. Then peel and slice the beets. Set them aside. 4. Layer the greens on a large serving dish. 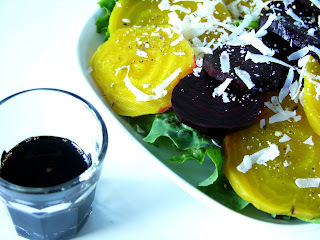 Layer the beets over the bed of greens, then lightly baste them with olive oil. 5. Drizzle the salad with the Balsamic vinegar and add the black pepper (if desired.) Top with grated/shaved cheese. Note: It’s important to use a high quality Balsamic vinegar for this recipe. I would check a specialty grocer for best results, especially someplace where you can taste it before you buy it. You’ll want it to have a very thick, viscous body. And make sure it’s actually made in Italy.